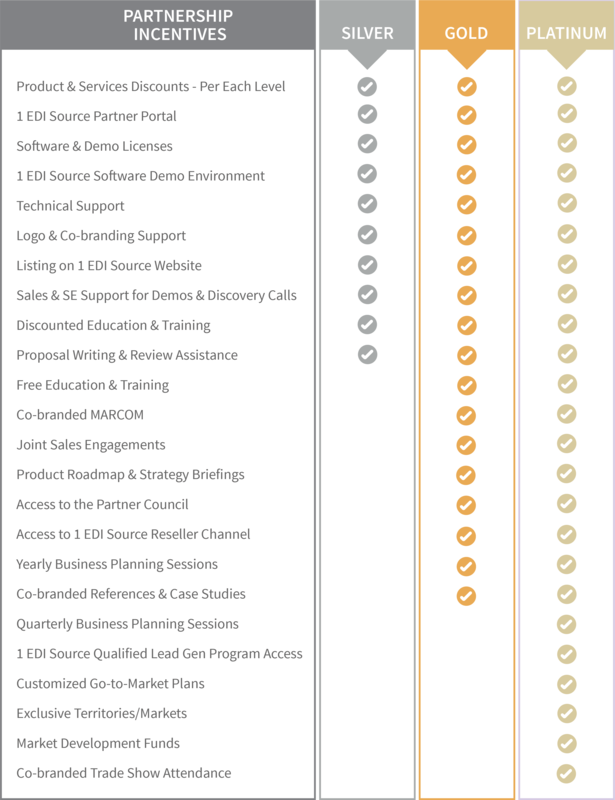 The 1 EDI Source Partner Network is an ecosystem of services, reseller, referral, cloud hosting and integration partners. The network is dedicated to providing each client with the highest degree of integration services and software satisfaction. Partners in the program receive access to sales support, marketing, training, solutions support, demo environments and other enabling tool sets and personnel. The Partner Network is designed to help partners grow their business by offering innovative 1 EDI Source products and services or by offering 1 EDI Source products with partner delivered services. There are 3 Tiers of Trade Support with Varying Partnership Incentives, see chart for more details. Silver level membership provides basic development, support, training and marketing resources. Gold members experience faster business growth, and receive access to the 1 EDI Source reseller channel, co-branded references and more. Platinum members receive all of the benefits of Silver and Gold along with qualified lead generation opportunities, joint go-to-market campaigns, market development funds and more. The Platinum membership is by invitation only. Our reseller partners achieve even higher value. Resellers own the client relationship, sell the solution to the client and have the choice to deliver client support; increasing the partner’s share of the client revenue. Services partners have the greatest opportunity to grow revenue. Not only do services partners maintain the client relationship during the sales and support processes; services partners also deliver the professional services needed to on-board and expand the client’s solution. These services can include trading partner on-boarding, integration writing, EDI mapping and much more. Our services partners also deliver Tier 1 client support to their clients. Integration partners deliver the initial go-live ecosystem to the client. An integration partner will set up the environment, on-board the trading partners, and implement any integration or EDI maps. 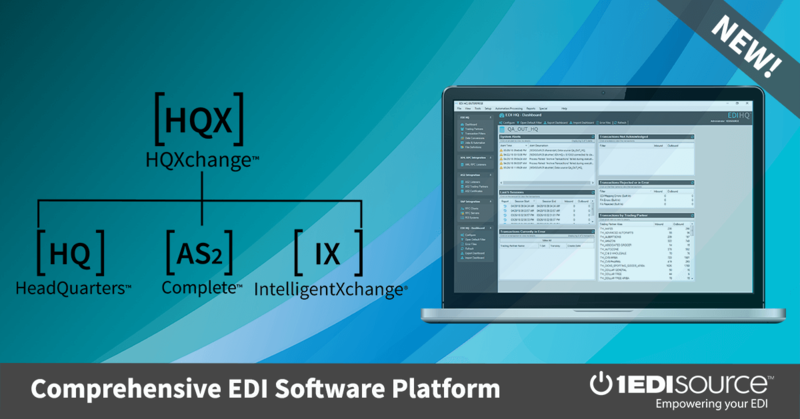 Integration partners will typically pass the client relationship to 1 EDI Source once the solution is implemented. Cloud partners are given the right to use 1 EDI Source in a public cloud, creating a clearing house for EDI transactions. 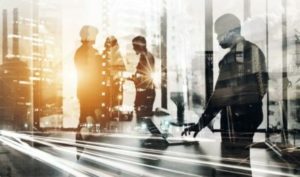 Most cloud partners use 1 EDI Source in connection with other cloud software they currently deliver to their clients.